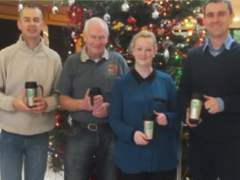 To promote awareness of waste prevention Monaghan County Council purchased ceramic reusable coffee cups for distribution throughout the County. Monaghan County Council worked with a number of Tidy Towns groups, using their local knowledge to ensure that the cups were distributed to appropriate outlets such as coffee shops and service stations. Each business that participated received between 10 and 15 cups, along with a poster. The shops were encouraged by the Tidy Towns to give the cups to their “regulars” who in turn would use it on a regular basis. In terms of awareness and promotion of waste prevention the project has been successful, with a lot of coverage on local media, social media and there was even a small article in a national newspaper (Irish Independent 6/11/2013). Anecdotally, each shop has experienced different levels of success with the cups, with one saying that nobody returned with their cup, with another reporting that at least 50% of the cups were being used on a regular basis. A further project was developed when meals on wheels service asked could they receive some of the cups to use as soup containers. 40 cups were purchased for them as they estimated that they would save €600 and 2500 disposable cups per annum. Why not give something like that a go in your community?